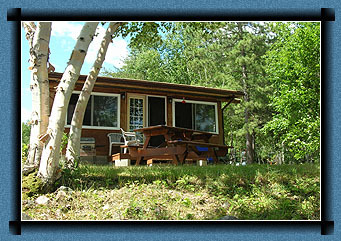 Housekeeping Cabins: Cedar and pine throughout, this deluxe cabin has a lake-view sitting room with wall-to-wall windows. It sleeps up to 6, has a 4-piece bath, kitchen, back deck, barbecue, and fire-pit. With propane heat, it is ideal for your winter visits.